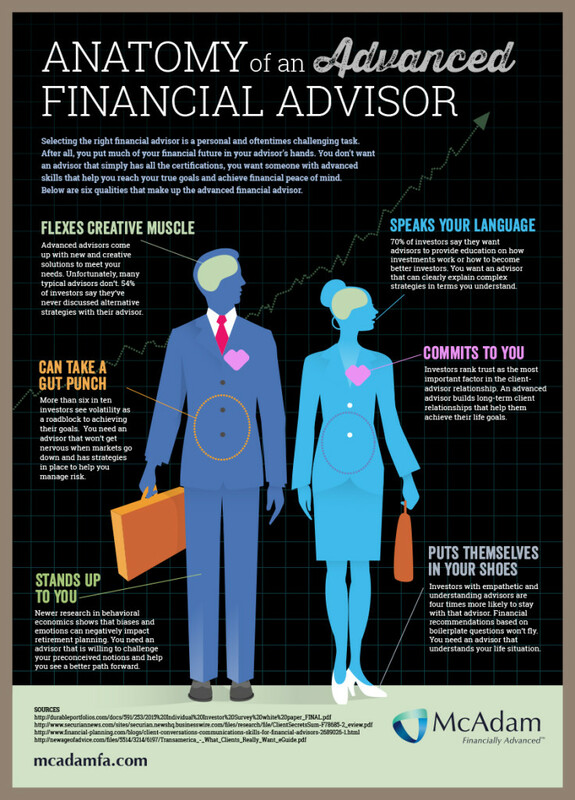 Philadelphia PA– July 8, 2015 – McAdam, the Philadelphia-based boutique financial planning firm with nearly 200 advisors, released an infographic today outlining the six key qualities of an “advanced” financial advisor. With well over a quarter million financial advisors currently in the United States according to a study by Cerulli Associates, the infographic has been researched and designed to act as a helpful guide for investors to make more intelligent decisions when selecting their financial advisors. Flexes Creative Muscle –Advanced advisors come up with new and creative solutions to meet your needs. Unfortunately, many don’t. 54 percent of investors say they’ve never discussed alternative strategies with their advisor. Puts Themselves in Your Shoes – Investors with empathetic and understanding advisors are four times more likely to stay with that advisor. Financial recommendations based on boilerplate questions won’t fly. You need an advisor that understands your life situation. Stands Up to You – Newer research in behavioral economics shows that biases and emotions can negatively impact retirement planning. You need an advisor that is willing to challenge your preconceived notions and help you see a better path forward. Commits to You – Investors rank trust as the most important factor in the client-advisor relationship. An advanced advisor builds long-term client relationships that help them achieve their life goals. McAdam is an independent financial advisory firm with a nationwide network of more than 200 advisors operating out of six offices in Philadelphia, Chicago, Boston, Tysons Corner, Jersey City and St. Petersburg. McAdam has developed an intelligent advisory model known as its Advanced Advisory ModelTM. This model integrates all three areas of financial planning: the financial, the personal—and the professional, to help McAdam’s clients achieve their goals. With the firm’s advanced knowledge and deep experience they help professionals make informed decisions and provide a new level of clarity and control.